__ The arch, as a structural element, has been known and used by people for thousands of years. Even though the Romans has left us churches and aqueducts and the arch was commonly used until not long ago the houses built nowadays rarely use arches, vaults or domes. Our houses tend to use wooden or, most commonly, concrete architraves. The arch, contrary to the architrave, distributes weight uniformly. This explains why an arch can create a bigger opening than an architrave, their section being equal. When the sides of the arch are properly supported by buttresses, which counter act the lateral forces, then the arch can bear huge loads, an example of this phenomenon are the underground tunnels. On the contrary the weigh an architrave can support depends only on the resistance of the material composing the architrave itself. An arch spinning around its centre creates a dome. A dome, using the principle of the arch, becomes a shell structure, which distributes the weight equally and transfers the forces laterally. The shell structures even if very thin can be very resistant. This is the reason why it is the shape we can often observe in the Nature. The resistance of the eggshell to the pressure we apply from both endings when we try to break it is impressive. especially when we realize how thin the shell is. A dome, apart from being very resistant, it also behaves much better than a post and beam structure during a seismic event. A dome structure works in compression therefore it has to be built with materials which respond well to compression forces. The earth, when it has the right mix, even if it is not as strong as bricks or concrete it has a compressive strength (kg/cm2) more than adequate for the construction of a dome. Nevertheless it is always necessary to make some tests in order to verify the compressive strength of the earth we decide to use. 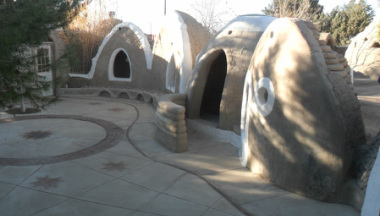 By building a dome we avoid cutting trees or using iron and cement to build a roof; this has an important impact for the economy and ecology of the house and more over it makes a lot of sense in arid areas where trees are not very abundant. Among the different ways to build an earth dome the “superadobe” technique stands out for its simplicity and efficacy (consult the section “Build with earth” for more information). 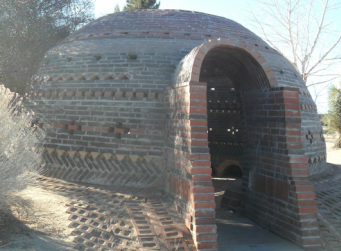 With this technique it is possible to build domes, which can resist violent earthquakes, as tested by the Cal-Earth Institute. 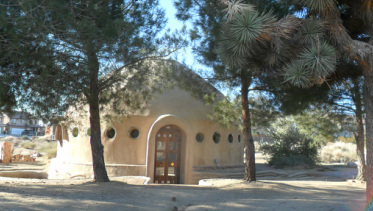 A dome built with the superadobe technique can withstand earthquakes, hurricanes, fire and floods according to the California standards. Since an earth dome doesn't have a roof it needs to be adequately protected from the rain; there are different ways to protect the dome according to the level of maintenance one wants to achieve. A dome is quite different from the houses we are used to live in because it creates a uniform space with no corners and in which there is no separation between walls and ceiling. This kind of geometry is much more in harmony with our nature than a cubical room because it better reflects the shapes we find in the nature. Being surrounded by organic forms, which are soft and not aggressive has a positive effect on our psychophysical health. 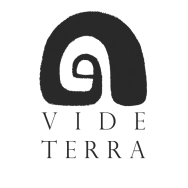 At the symbolic level the earth and the dome recall the womb of the mother, a place, which preserves and protects the life during its growth and transformation. 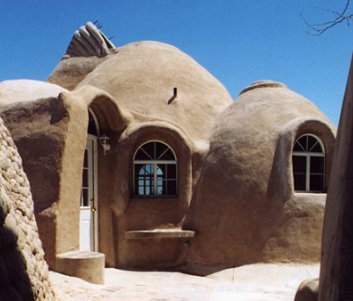 It is possible to create a home composed by a single dome or by different domes interconnected with each other, it is possible to span from a small emergency shelter to a big house with several rooms. 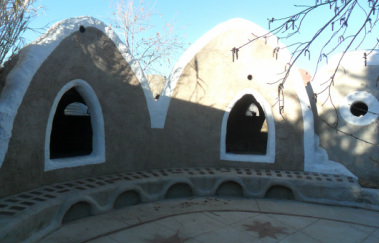 With the superadobe technique it is possible to quickly build temporary or permanent emergency domes, which can give a safe shelter to people during seismic events. Moreover, these kinds of shelters assure an indoor quality superior to tents or containers especially in the long run.